Which Commercial Mopping System is Right for Your Building? Mop buckets come in a range of colours and designs. 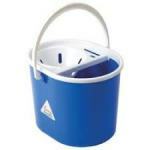 Most common buckets are provided in colours that compliment colour-coded cleaning regimes and have detachable wringers and handles removing the wringer allows the bucket to be used as an ordinary pail for other general cleaning tasks. It also makes cleaning the bucket a lot easier for the operative.